I really need to use the stamps more I think tags are going to be in order for Christmas pressies! As I have been slacking on inking these great stamps. I hope you have enjoyed this traditional card & thanks for popping by. In addition I added some rhinestones, linen thread & a banner with a birthday sentiment from Build a Birthday. So I haven't blogged in a while, life seems to get in the way sometime. June was a busy month for me went to a couple of concert, one in my home town Bristol to see the Kasier Cheifs & the other was in Edinburgh to see the Piano Guys it was well worth going there. I have made another 14 of them for a training event I'm attending to inspire others as well as you! I really wanted the cake to be the focal point which is why I went with a very clean & simple look. I hope you like it & see you soon for my crafting inspiration. So you can probably see why it took so long. We have raised over £1,800 for cancer research uk! Thank you if you supported & thanks for popping by, I will be back again in a couple of days time. My colleague has become a homeowner so I thought to add first really fitted. I used a recent SAB stamp that had houses on & co-ordinated nicely with the What's Up punch. I raised one of them up to make a focal point & used a nice bright yellow dap from the Birthday Bash & to add some texture I embossed a piece of Old Olive. I got some of my work colleagues to sign it & had a quite a few comments saying they liked the card. Thanks for stopping by to see what I have created. So I was running a but late in crating my You Can Create It challenge for this month, I saw this weeks Paper Players challenge & wanted to combine the two. I only got chance to look at this this evening. Hope you like it. It took me a while to figure out what colours to incorpoate with the card base, something borrowed dsp, the hearts & the gem. I got the colour coach to get some inspiration for colours to use - was a big challenge!! 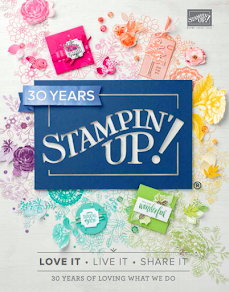 Hopefully my fellow stamping' up team mate Claire has also taken part in this challenge too. Thanks for stopping by to see what I created. I just made it very simple woth the summer silhouette's stamp set. I love thos stamp set... I haven't used it for a while so thought I would grab it from my collection.